Everyone has a ‘flavor.’ At least, that’s what Amy says. To her, some people taste like sweet things, like chocolate or mint. Others probably taste like burnt toast or black licorice. Still, everyone tastes like something. So when Amy encounters a boy who doesn’t seem to have a flavor, she’s understandably intrigued. Just who is this boy? And where is he from? That’s the driving question behind Space Boy, the webcomic-turned-graphic novel series by writer/artist Stephen McCranie. 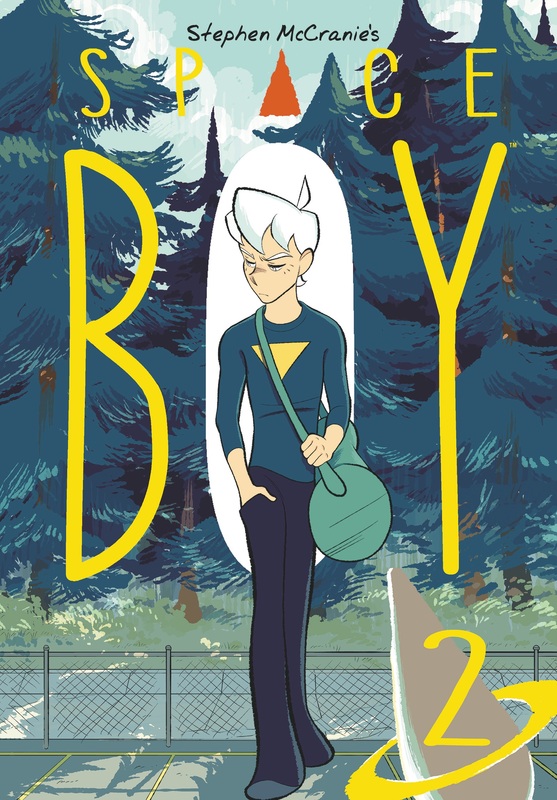 Launched in March of 2015 on webtoons.com, the series follows Amy as she goes through some big life changes, and as she gets to know the mysterious Oliver, the boy without a flavor. 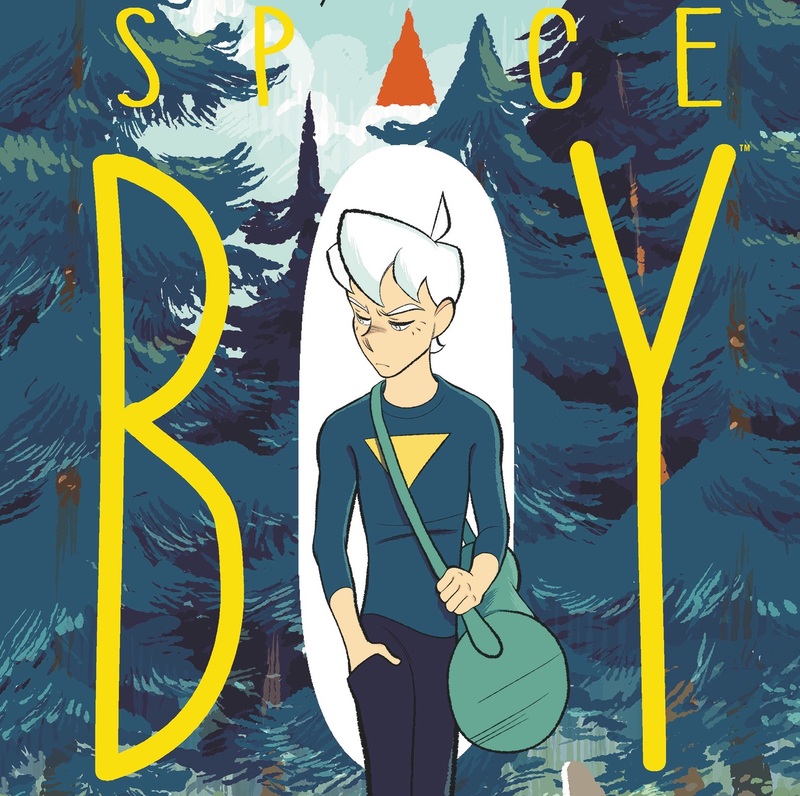 The first print volume of Space Boy came out back in June, and volume 2 releases widely today. I loved the first book, so I was thrilled to have the opportunity to ask McCranie about the series’ development, the transition from webcomic to print, and more. Joe Grunenwald: The title of the comic is Space Boy, but the focus through two books has been almost entirely on Amy. She’s a wonderful character with a lot of personality, and she’s been through a lot already. How did you approach developing Amy? Did you draw from any personal experiences? Stephen McCranie: Absolutely. When I was a kid we moved a lot—nine or ten times! Sometimes we went across the country. Once we moved literally across the street! Amy’s move to Earth mirrors a lot my experiences as kid. Having to adapt to a new environment, a new culture—having to make friends and find a place to fit in—these were the things I was concerned about when I was young. Grunenwald: Where did the “flavor” aspect of Amy’s character come from? That’s such an interesting way to give readers a quick idea of who characters are. McCranie: Amy’s special kind of synesthesia allows her to “taste” the essence of people—she has an intuitive grasp of who someone is just by looking at them. That’s why meeting Oliver is such a shock– he is the first person she’s ever met that doesn’t have a flavor. The concept was inspired by the character Death, from The Book Thief, who enjoys tasting the ever-changing colors of the sky as he wanders about the Earth. Grunenwald: Amy is our gateway to Oliver, who’s compelling in his own way. Two books in and it feels like we’re still just scratching the surface on who Oliver is. He seems wise beyond his years, but at the same time in some ways he acts like a typical teenager. What is it that draws Amy to Oliver? Is it just that he doesn’t have a ‘flavor,’ or is there more to it? McCranie: Amy lost her home and her friends when she moved to Earth—and I think she senses Oliver understands what that’s like—to be separated from the place you grew up, and from those you love. She seeks him out to talk about those things which she can share with no one else. Grunenwald: The book is set in the future, but it still looks and feels very contemporary. The Google Glass-like Net Gear’s AR technology is a great analog for social media and the way people present themselves and experience the world. Was that a conscious choice, or do you view something like Net Gear as a logical step for technology? McCranie: It’s more commentary then prediction—but who knows what future holds! Perhaps we’ll see everyone wearing augmented reality glasses soon. I tried to be as fair as possible with my critique on social media. I don’t deny it has benefits—I’m just not sure it always gives more than it takes. McCranie: Thanks! I wanted to give younger readers a picture about what to expect when they get into high school—the joys of friendship and the exciting risks of dating for the first time. Grunenwald: Reading a webcomic can be very different from reading a print comic. One of the great things about the Space Boy webcomics is how you use the format to control the pace of the reading experience. 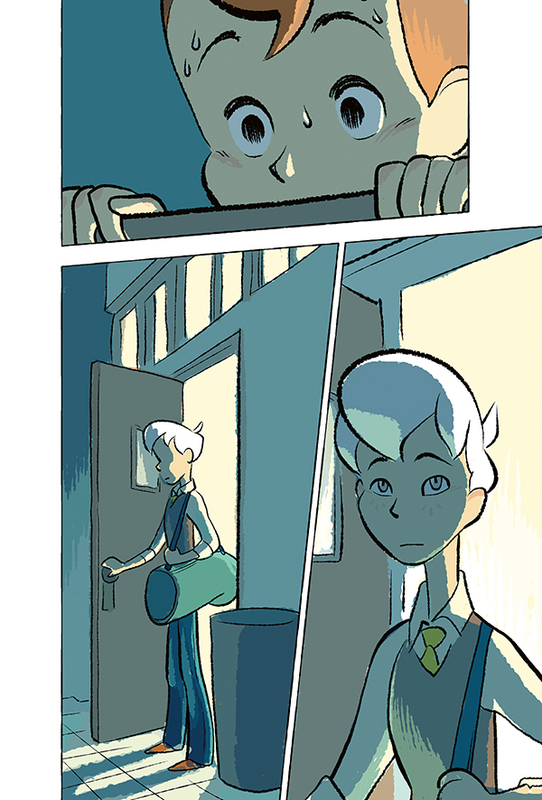 How has the process of adapting Space Boy for print been? Have there been any benefits or challenges you weren’t expecting? 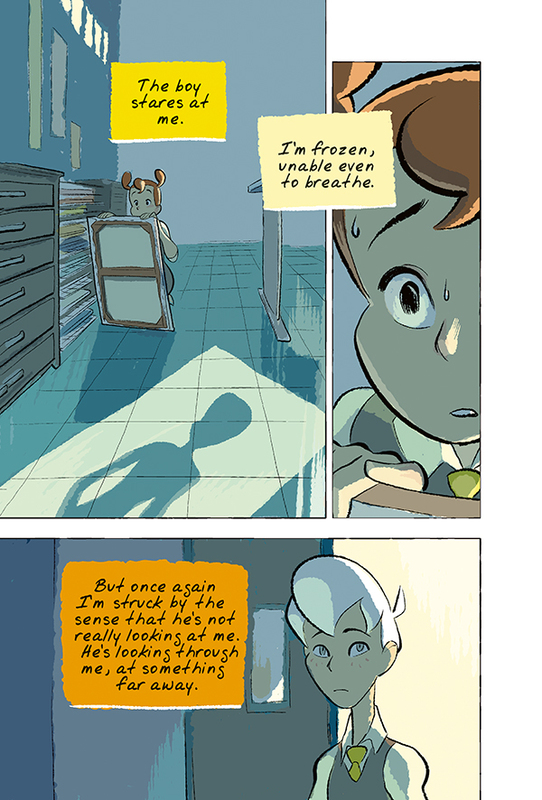 McCranie: The mobile-friendly scrolling format that Space Boy has on Webtoons is a super nice way to do comics for the very reason you mentioned—however, I’ve always thought of Space Boy as a book. 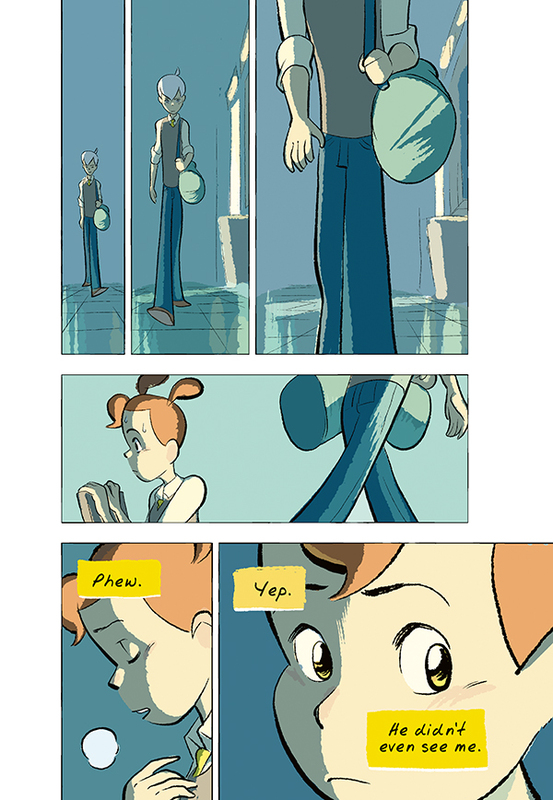 I drew the comic in a page format, and then adapted it into the webcomic format afterwards. Getting Space Boy ready for print wasn’t difficult at all. Grunenwald: The two volumes of Space Boy material that’s been collected at this point is over three years old. How’s it been to revisit that work? Have you found any surprises, or other things about your work from that time that are different from your work now? McCranie: I’m just proud something I made so long ago is still alive and kicking, leaping into a new market—hopefully to find new readers and connect new people to the story. This is the best work I’ve ever made, and I’m excited to share it! Grunenwald: Do you know how many printed volumes of Space Boy there will ultimately be? Is the story still ongoing online? McCranie: I publish one episode of Space Boy per week on webtoons.com—so be sure to check that out! The intense pace of the Webtoons production schedule has me making a significant amount of content—about 3 books per year! Last I checked I’ve completed about 10 or 11 volumes, so the series will be pretty long. I’m super thankful to Dark Horse for getting behind these books and making it all possible. Grunenwald: Is there anything you’d like to say in closing to anyone who might be on the fence about checking out Space Boy? McCranie: I really think you’ll like it. Just read the first couple episodes online, but make sure you have some time cleared away—it’s definitely addicting! I’ve gotten emails from people who say once they started they had no choice but to binge the whole series in four or five hours! And thanks for reading this interview! I’m glad you exist! Published in print by Dark Horse Comics, volumes 1 and 2 of Space Boy are in stores now.